Miss A here with a guest post about stalking your loved ones. Are you a Facebook stalker? Thanks to the World Wide Web and mobile phones stalking has become such an easy and accessible task. It has almost become the norm to invade your loved one's privacy. 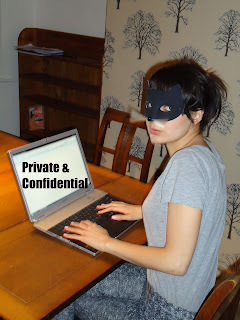 Facebook and Email: A true stalker will have the login details necessary to increase maximum stalking potential. First stop: Inbox. Second stop: Sent Items. But even without these you can get a lot of stalking done. Check every new friend request. Who is this new girl? Do they have friends in common? For extra stalking pleasure, you can check their Facebook history, where has been looking? Checking out scantily clad teens is stalker jackpot! I feel tears and tantrums coming! Checking general Internet history- Has he been on inappropriate sites again? What did one do before the invention of all this wonderful stalking technology? No stones were left unturned- Through using careful listening and thorough investigation techniques. He said he is going out with friends but you can't come. So, what do you do? A drive by or sending in your girls are full proof checking up techniques. You call the land line and ask to speak to your loved one and are shocked when his mum says: "Sorry love, who is this?" WHO IS THIS?? Is she mad, why it's you of course! Time to do some serious investigating... Where is that itemized phone bill? Despite my knowledge of stalking I would never call myself a stalker of love. However, through reflection I have seen that I have been through the process of a "stalking learning curve" where I have learnt to reel in my stalking urges. Q: Did I have his Facebook and email login details? Q: Did I read his Inbox and sent items? Q: Did I check his Mobile phone? Q: Did I check his Internet history? So, why did I think I never stalked him? Because all of my stalking amounted to no results. He was one of the good guys. Note to self, stalking is not result based. Exhibit 2: Passed relationship ending 8 months ago. Immediate reaction is that I was involved in slight stalking. Growing up and deciding that invading your loved ones privacy is wrong had made me an advocate for non-stalking. However, my gut instinct informed me that this man was a rat, I checked his Facebook inbox one time only and had all the evidence of foul play that I needed. Should I have been stalking this man? The answer is that I should never have been dating this man. After discussing stalking techniques from the past and present and learning from mistakes with slight hiccups, I have arrived at the important question. Should you stalk your loved one? My answer on the whole is NO. You stalk because you are insecure and want to trust but how can he trust you if you stalk him? When stalking goes wrong you can end up feeling like a fool as well as getting a name for yourself that starts with Crazy... A good friend of mine ruined a loving relationship through her love staking ways. She was doing her usual stalking method of looking through her boyfriends emails, when she found that her boyfriend had been enquiring about Bridal Sets convinced that he was going to propose she set herself for a huge fall when it turned out that he had been helping a friend of his out, this ended in humiliation, tears and a broken relationship. When Love stalking is acceptable: There are different levels of stalking, the above techniques that I have been through are only acceptable in extreme situations, such as if your relationship has come to an end and you need confirmation that this man is wrong for you. If you are with a lovely man, do not stalk him, it just isn't fair or kind! Other acceptable stalking methods include; initial check ups, for example you have met a new man so where is the harm in getting a better feel for him through checking his Facebook? Check his photos, wall, info and friends. That should be enough to get a good picture. Other than that try and refrain. Warning: Love stalking is not good for the soul, it can cause pain. Miss A is a Fashion Consultant for Kranich's Jewelers; browse through for great gift ideas, including Mothers Rings and much more! Wow that is creepy, I have know people to do that and have never understood what drove them to it. It is kinda weird. Ha ha, it is quite common in fact! The joys of Social Media!